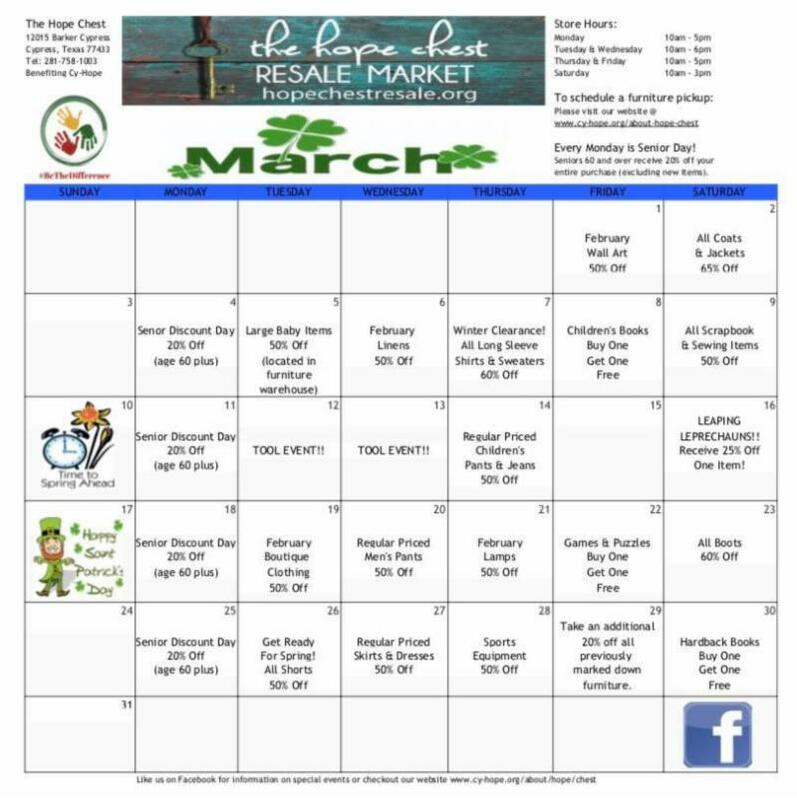 The Hope Chest Resale Market is a 25,000 sq ft warehouse and shopping area that benefits the programs of Cy-Hope "making life better for kids in Cy-Fair". Don't miss the chance to experience this unique marketplace that breaks the mold of the traditional resale store! This Cypress area "boutique style" resale market features designer clothing and home decor, as well as 7000 sq ft of furniture and outdoor equipment. Pinterest fans will love the "DIY and Repurpose Corner" where they can find treasures in need of just a little TLC! The "Locker Room" is especially for the sports and outdoor enthusiast. Kids will enjoy browsing the cozy toy area for popular toys that can be found at a fraction of the retail price. There is so much more to see and the inventory changes daily, so plan your trip to The Hope Chest today! We're located at 12015 Barker Cypress Rd in Cypress (the southwest corner of Barker Cypress and 290). Want to volunteer at The Hope Chest? Students (ages 16 and up) click here to sign up (walk-in volunteers are not accepted). Adults, click here to email The Hope Chest Volunteer Coordinator. 12015 Barker Cypress Rd., Cypress, TX 77433 (southwest corner of Barker Cypress/290). Click here to request pick-up service for large items.